During the Star Wars: The Force Awakens global press day, the elaborate costumes used for the film came up. While some, like Rey's desert scavenger outfit were fairly simple, taking "about twenty minutes" to get into, others, whether the virtual dots of Maz Kanata that Lupita Nyong'o had to be suited into ("she had dots on her teeth - everywhere!" Director JJ Abrams said) that took two and a half hours to get into or the many-layers of Kylo Ren, took a long time to design and to assemble. Abrams said that Kylo Ren's was the "most difficult to arrive at," with some surprising elements to it - in fact, Captain Phasma's costume came out of designs for that. After he praised Michael Kaplan's designs for the film, saying he "can't wait for you to see what he's done," he gave more on the secret origins of Kylo Ren and Captain Phasma's outfits. "We went through, I don't know how many hundreds and probably thousands of iterations and different versions," he said of Kylo Ren's look. "One of the great things about that was, over the course of that, the costume for Captain Phasma was designed, that was actually pitched as a Kylo Ren costume originally. For story reasons, it didn't make sense and didn't work. We suddenly realized, 'oh my God, this is one of the greatest looking costumes I've ever seen.' He, then she, became one of my favorite characters in the movie," Abrams noted about Phasma. "The design of Kylo Ren was the most difficult one, and when we finally saw the mask, and the beginning of that design, it was really instantly clear that was the winner. I'm very grateful to Michael and his whole amazing team." 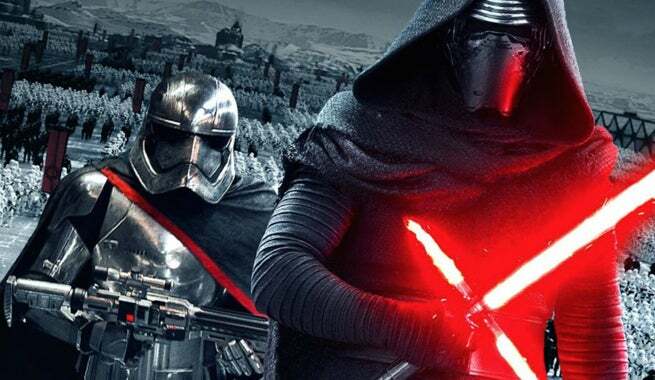 Star Wars: The Force Awakens is in theaters next week.